A common concern and question for the jump coach of any level is simply this. The season is over… now what? If not moving into another sport, what comes next for off season training? Recently for some reason I have been inundated with questions about this time of year, a time of year no one typically puts much thought into. The purpose of this article is to share my thoughts, practices and experiences with you regarding making the transition from the end of one season to the beginning of another. As a rule, at the completion of the competitive season, I give jumpers 4-6 weeks off from formal training. This is not a period of inactivity, but a period of freedom from the rigors, schedule and obligations of formal training. During this time jumpers are encouraged to be active and train informally. Any type of off season training is ok, but they never receive a page with a prescribed workout on it. They can jump, run, lift, do general strength, or anything else, but with no formal structure and schedule. During this time, other sports and cross training are ideally a big part of picture, and the bigger the better. This is a great time for them to get the basketball out of their systems, but volleyball, tennis, even hiking or biking are great alternatives. Often athletes are physically fully recovered long before this time is up, but I never rush them back. Keep in mind this is a period of psychological recovery also. It’s a time for them to get over being tired of you, your rules, your demands, and your structure, and well as competitive pressures and the mental strain that comes from advanced technical skill training. Recovery from these factors is a much slower process, so I never rush things. Once this period of time is over, I have the athletes do off season training cycles over the summer. These are structured workouts that resemble typical jump training, but with certain differences and variances. Usually these resemble typical general preparation work. Each cycle consists of a weekly workout, to be repeated three times, making each summer cycle last three weeks. The themes within the cycle are very similar to normal general prep themes. The training week has four days of training, two days of prescribed cross training, and one off day. I might be at the track and watch these workouts, but I don’t make it mandatory that the athlete train with me on my schedule, unless they ask, for the reasons mentioned above. This is a great time for older athletes to take ownership of a training group and exhibit some leadership and mentoring skills, assisting and coaching the youngsters. The number of summer cycles an athlete will do depends on the length of their season, how far they advanced in postseason competition, and the starting date of formal training the following year. Between the summer cycles, athletes take rest weeks. These weeks are not total rest weeks, but consist of informal training as done during the 4-6 weeks of off time at the season’s end. One key psychological component to my summer off season training is the athlete taking ownership of the training. This is a good time for maturity training. One small point that has a big effect is that I never send the athletes a summer cycle unless they ask for it. I tell them to contact me for the first cycle at the end of their down time, and I ask them to contact me for the next cycle when the first is complete, and so on. This tells me if the jumper is training or not, how diligent the jumper is, and forces the jumper to initiate communication with me periodically. I know for a fact that this practice often results in some positive peer pressure from older team members, and helps to build a strong effective training group. As previously stated, these cycles are very similar to my usual general preparation cycles, but with twists for variance. Also, I try to avoid training with a high, precise technical component, because I might not be there to monitor it, but also I want the athletes to be able to work hard without a lot of thinking and mental drain. I also keep them away from advanced equipment and have them use simple gear. Each cycle normally has these components, along with the corresponding warmups. A day with acceleration work, multijumps, Olympic lifts, and static lifts. A day with some modified speed or acceleration component, along with multijumps, Olympic lifts and static lifts. An extensive day featuring a tempo running session, normally followed by general training. Cross training days, consisting of a prescribed number of minutes of some other sport. Also in the cycles should be the roots of your lower leg conditioning-shin splint prevention program, as this is the ideal time to begin it. As far as the cross training days, my favorite is tennis or some racquet sport. The opponent is across the net so you don’t have to worry about stepping on some person’s foot and spraining an ankle, and if your athlete has combined event potential, the use of the arm improves throwing ability. Typical twists I will employ in the summer cycles include these. Acceleration Development done on the flat or on the stadium steps. Speed development (technically) work done on the stadium. Multijump circuits of lower intensity than any I would normally do in the training year. Breaking rules on weight training numbers. For example, I might do sets of 6 on Olympics, or sets of 10 in squats or presses, which I would never do under normal training circumstances. Breaking rules on tempo work, by going longer or shorter with run efforts. For example I might do something like 16-20x60m (shorter) or 3-4×300 (longer), things I would likely never do normally. Altering typical sets, reps, and recoveries in general training. I will do specific prep work in a summer cycle only under unusual circumstances, those being when an athlete has, after their off time, 3 months or more before the resumption of training. In those situations moving from a general model, to a specific model, and then back to a general prep model is good practice and avoids staleness, but keep in mind many specific prep activities are dangerous for athletes to do unsupervised. Plan carefully if you won’t be there. Generally I try to avoid highly technical things in the off season training, giving athletes a break from the intense mental focus technical work requires. There is one significant exception however. If an athlete has a major technical change that must be made, this is the time to do it. An athlete who will change jumping legs, or switch from a double to a single arm style, or any other radical technical changes requires time for adjustment. Usually doing this in the normal preparation period doesn’t allow enough time for the changes to stabilize. 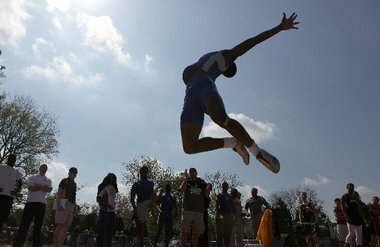 How to Quickly and Easily Fix Common Errors in the Long Jump, High Jump, and Triple Jump.